Dorado just got a food truck a few months ago. 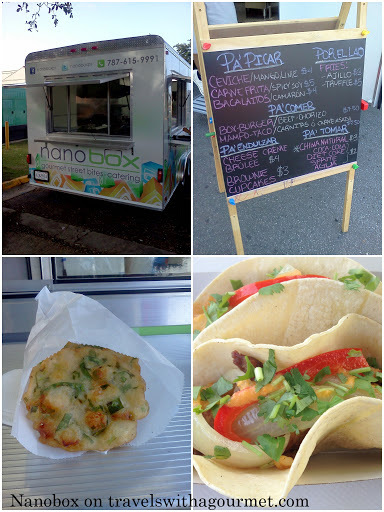 Nanobox Gourmet Bites and Catering is usually parked behind La Hacienda and Walgreens on weekends and is run by Culinary Institute of America-educated chef Nano and his brother. The menu changes often and has modern Puerto Rican bites served in takeaway boxes. They have a few appetizers (pa’picar), mains (pa’comer), desserts (pa’ endulzar) and sides (por el lao). I’ve been there several times and have had the bacalaitos (shrimp fritters), the Asian-inspired carne frita (crispy pork in sweet spicy soy), mampo tacos filled with carne frita and the box burger. Service is quick and friendly, the food is good and it’s fun.